This article is under construction. Be patient. As one of the last groups deployed to England, the 492nd Bomb Group arrived with more experienced men within their ranks than any other group serving in the ETO. They had more flying hours going into the war than most would have at war's end. Many of them were the instructors that had trained many of the airmen during the arms buildup while others were veterans of the Maryland National Guard's 104th Observation Squadron Anti-Submarine patrol that had been defending America's coast. The most noticeable trademark of the Maryland National Guard's 104th Observation Squadron was their precision formation flying. During the 1920's and 30's their airfield outside Baltimore was used numerous times to host air shows. Professional stunt pilots and daredevils came from all over to perform. The 104th was bitten by the show bug and began using the events to show off their skills in the air. Each time they wanted to be better than before. Needless to say, they kept raising their performance level. To do that safely, they had to impose a very high level of discipline upon themselves. Within a little over two decades, the 104th had established an elevated brand of military discipline and traditions. Their hard-line philosophy was simple. They found that by requiring strict discipline in small, trivial things, like a proper salute, it would build a better foundation for the important things, like flying. The Maryland Guard also wanted to look, act and perform better than the regular soldiers. The 104th became a first-rate squadron. The tougher discipline had more than just an affect on flying formations. It elevated each man's self confidence and enhanced his trust in the others with whom he served. Each man would be able to cope with stress and emergencies better than before. Discipline, conditioning, training and practice, practice, practice became their hallmark; characteristics extremely important for any type of military unit going into battle. As America's buildup was nearing its completion, these men were allowed to put in for combat duty. They represented America's best, and the Mighty 8th Air Force had great expectations for them. They became the 859th Bomb Squadron, the cadre source for the new 492nd Bomb Group. As a first class outfit, these former anti-sub boys wanted to stay that way. As new crews came into the 492nd during Jan 44, they began drilling them with the same discipline they had inherited from the Maryland 104th. It didn't take too long for most of the new guys to catch on, although mastery was not something that could be learned overnight. The elite of the 492nd had the flying experience and confidence to quickly spread out a their formation when entering a flak field and to stack themselves practically on top of one another to execute turns without leaving planes on the outside struggling to keep up. They could spread themselves out for better carpet bombing or form a stacked column to better hit a precision target. They could present a menacing wall of fire with a tight formation that exuded a certain "body language" that would cause Luftwaffe fighters to back off and look instead for a loose, sloppy formation elsewhere to attack. Between the time the 492nd Bomb Group got to England and their first combat mission, they practiced under the watchful eyes of the combat generals. The Commanding General of the 2nd Air Division, James Pratt Hodges, in checking them out, was so overwhelmed with their precision formations that he ordered the 492nd to fly their next exercise at low level so that the other 11 groups in the region could see what good formations were supposed to look like. 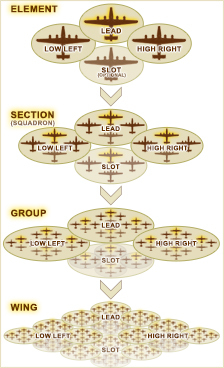 Bombing missions were a very tricky business, requiring precise orchestration between the three or four aircraft in each element; the lead, low left, high right and slot positions of the elements that made up each section; the lead, low left and high right sections that made up each group; and the groups that made up each wing (which looked just like the group formations, only much wider, often extending to over a mile across). When any portion of the entire attack force faltered, things could go dangerously awry. For example, if an entire group were to properly execute a turn at a specific point and time, but the other groups in the wing were off by 20 seconds in doing so, that first group could easily find itself stranded far enough away from the others to be vulnerable, easy pickings for an unexpected attack by the Luftwaffe. The high standards of discipline in the 492nd did pay off in combat. Although they would go on to suffer more casualties in the shortest amount of time than any other Group, that was due to hard luck, the fortunes of war, the same perils faced by all bomb groups. On too many occasions the 492nd Bomb Group was attacked by the Luftwaffe when they had no escorts protecting them. They had to fight some of Germany's best fighter groups. On one mission they fought the Abbeyville Kids, Goering's pet outfit that was full of ace pilots. On another they had to slug it out with Germany's favorite hero, Major "Ramdahl" Dahl and his elite group of aces. The 492nd took heavy losses, but would have suffered even more had they not been so well disciplined. The best example of the need for a tight formation hit the 445th Bomb Group ruthlessly on 27 Sep 44 on the Kassel Mission, when they suffered the largest loss by a USAAF bomb group on any mission in WWII. Separated from the main bomber stream, the Luftwaffe attacked their already-loose formation, which completely fell apart with every B-24 scattering in all directions. The 445th learned the hard way that the integrity of their formations was literally a matter of life and death. Lt Col James Mahoney, the 859th Squadron Commander, 492nd Bomb Group, wrote his memoirs of the war, writing (as the title suggests) about what he witnessed and very little about himself, including the day that seven of the B-24 Liberators he sent out on a bombing mission to Germany failed to return. Seventy men lost. No bomb group in WWII lost as many aircraft and crew members in a three month period.